Bring your .22s! Experience the evil genius of Bones Brannon in a man-on-man .22 rimfire race you won’t want to miss. Bring your .22 single action pistol and lever, pump or single shot .22 rifle…and all the ammo you can scrounge. How fast can you blow up a balloon with a .22? She-nanigans three-person team shoot! Teams will be drawn at random and will use main match guns. Better throw in some extra ammo, you don’t want to sit on the sideline for this all knock-down extravaganza. To help raise money for a good cause, the ladies will be selling “dog-nabbits” which can be used to magically erase misses. Our charity this year is the AIS Cancer Center at San Joaquin Community Hospital in Bakersfield. Wear pink on Sunday. Folks from the AIS Cancer Center are planning to come out and we will take a group photo as we present our donation from the weekend. 5 Dogs Creek presents the 6th annual SHE-BANG! What’s not to love about this year’s ‘triple-B’ theme? 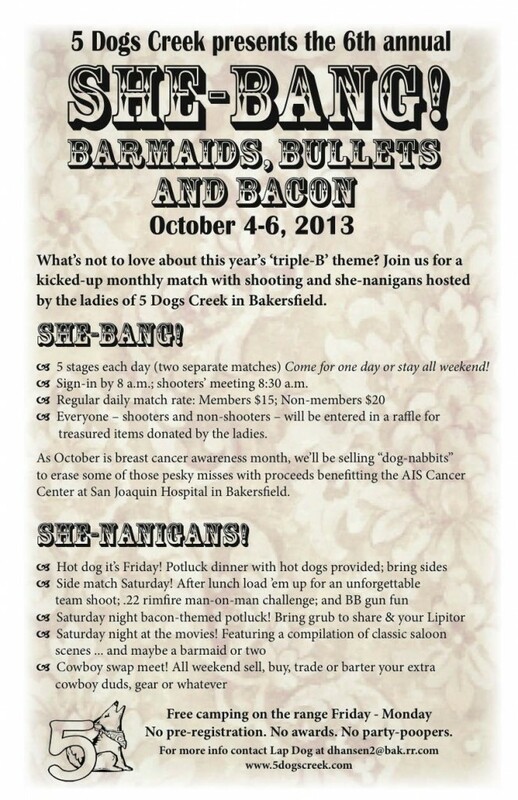 Join us for a kicked-up monthly match with shooting and she-nanigans hosted by the ladies of 5 Dogs Creek in Bakersfield. * 5 stages each day (two separate matches) Come for one day or stay all weekend! As October is breast cancer awareness month, we’ll be selling “dog-nabbits” to erase some of those pesky misses with proceeds benefitting the AIS Cancer Center at San Joaquin Hospital in Bakersfield. Free camping on the range Friday – Monday. No pre-registration. No awards. No party-poopers.